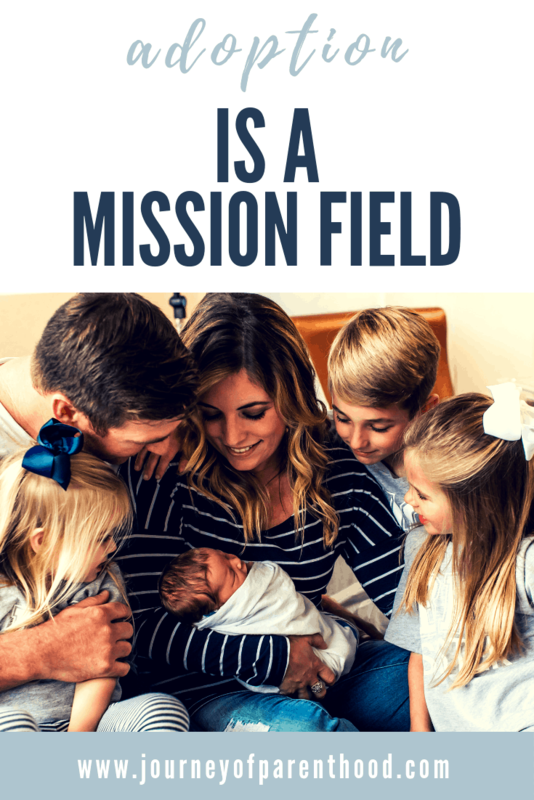 Adoption is a Mission Field. This post originally appeared at Christine Keys. Throughout my life I’ve heard people talk about feeling lead by the Lord in their lives. Feeling a tug on their hearts to do something, take action, step out in faith. I never really understood what that sort of feeling was like until God put it on my heart to adopt. My husband and I had casually talked about adoption over the years but it was always a “maybe, someday” sort of talk. Nothing concrete. Nothing serious. Always casual and always in passing. Then one day I had a conversation with a family who had adopted one of their children. And it was in that moment that I felt called to adopt. Not just as a “maybe” or a “someday” but a for sure, set in stone, this needs to happen for our family NOW kinda feeling. (You can read my full story about the ways God put adoption in our path here!). 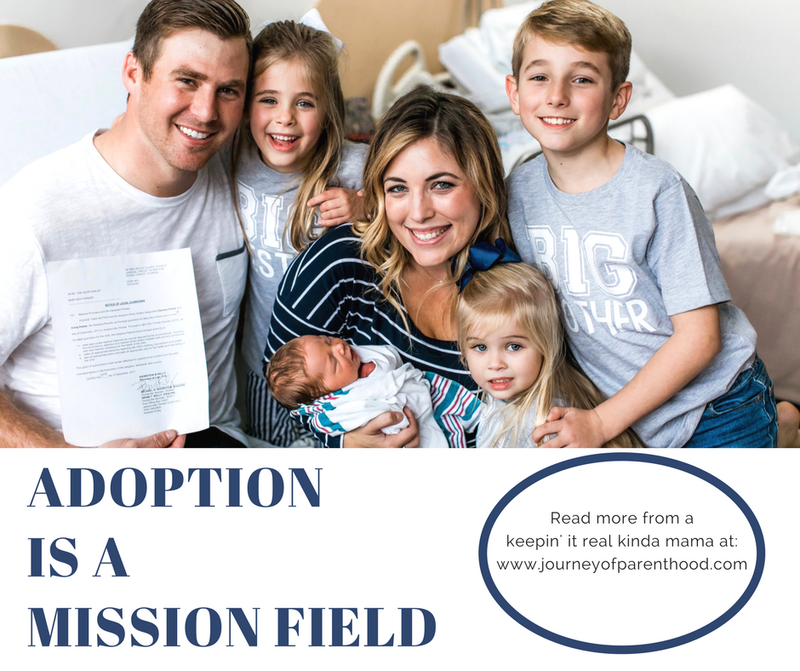 The adoption journey hasn’t been easy, but time and time again God has continually reminded us that it’s the best path for our family and that we were doing what He desired for us to do. Now we have our son and are simply waiting for the day for the process to be finalized! God is SO good and we are so blessed to see this experience come full circle. It has been interesting to me to see some of the responses regarding our decision to adopt. While SO many people surrounded us with love and support, we had several negative responses as well. Part of my mission during our adoption journey has been to remain truly transparent. Sharing all aspects of the process. From the highest highs, to the lowest lows. And I believe sharing some of the tougher moments is important to help others as they may be beginning their journey. It’s valuable to know going into something that you will face some tougher spots. One of those tougher moments? Realizing that not everyone supports your decision to adopt. I have been truly surprised at these negative responses, especially coming from many fellow Christians. My husband and I were just SO excited and thrilled about adding to our family through adoption and having some backlash was shocking to us. As a Christian I believe the Bible is God’s Word and I use the Bible as my guidebook for how to live my life. Whenever I’m faced with controversy I try to go back to God’s Word and see what HE says about whatever I’m struggling with. Through these verses we learn that we are all adopted into God’s family. When we become a Christian we become in His family and become His heirs. We aren’t born into that family, it’s not our “biological” family, but it’s Christ’s family. We are all adopted into God’s home. We also learn that everyone is called to look after the orphans and widows. All of us! Just as we are all called to spread God’s Word into all nations (Matthew 28:19-20) we are also all called to care for the orphans of this world. I have never personally felt called to do mission work. I have no desire on my heart to travel overseas and teach people the Bible. It’s not my personal calling. But I support those who do. Through prayer, financial support, and any needs I may be able to meet that they may have in their valuable work for the Lord. I don’t tell people that they shouldn’t travel to spread God’s Word because people in our backyards don’t know it. I don’t say they shouldn’t raise funds because they can afford to pay their own way. I may not feel called to personally do mission work, but I fully support those who do and know they are doing what God put on their heart and are spreading His love in an important way. I equally understand that many people don’t feel personally called to adopt. I don’t think it’s wrong to not choose adoption for your personal family. If it’s not your calling, then it’s not your calling. But the Bible is still clear that it’s a mission field on it’s own. The Bible DOES say that we should ALL look after the orphans. Not only do I believe our journey of adoption is a blessing to the child we’ve added to our family, but I believe it’s been an opportunity to be a light in the world and use our story to bless others. We’ve been able to have this amazing opportunity to get to know our son’s birth mother and have been able to be positive influences in her life and our prayer is that she feels closer to Jesus through our connection with her. I also have an avenue of sharing our story through blogging and the online community. Why would I keep this journey a “secret” when sharing it can bless so many others? Who knows who may read about our experiences and also feel that tug to adopt? Who knows the trickle down effect that my sharing could have in blessing others and spreading God’s Word? Most of all, adoption has blessed us. It has been a true walk in faith that has brought us closer to God, closer to each other, and has deepened and strengthened our spiritual journey and bonds as a family. Our son is a true gift from the Lord. Looking at him is a constant remind of God’s grace, love, and plan. It’s clear that God loves adoption because Satan so clearly despises it. Satan will do his best to put obstacles in the path of hopeful adoptive parents. He will put fear in their hearts and minds. He will try to deter them from their path. If you’re on the path for adoption: stand firm. Continue praying. Trust in the Lord and follow His lead. Keep stepping out in that faith and you will be blessed. If you know someone who is adopting, be a light for them. Don’t be a stumbling block in their path. Lift them up in prayer. Offer financial support even if you don’t think they “need it.” Be a listening ear for them. Reach out and remind them that you’re proud of them and that they are doing God’s work. And if you’re considering adoption for your family? Pray! Pray, pray, pray. Don’t rush the decision, but let God reveal His plans to you. Trust Him and He will lead the way! You can also read all the details about our adoption journey of our adoption page here. I hope it is a source of encouragement for those who are walking a similar path! I am always inspired by your adoption story. 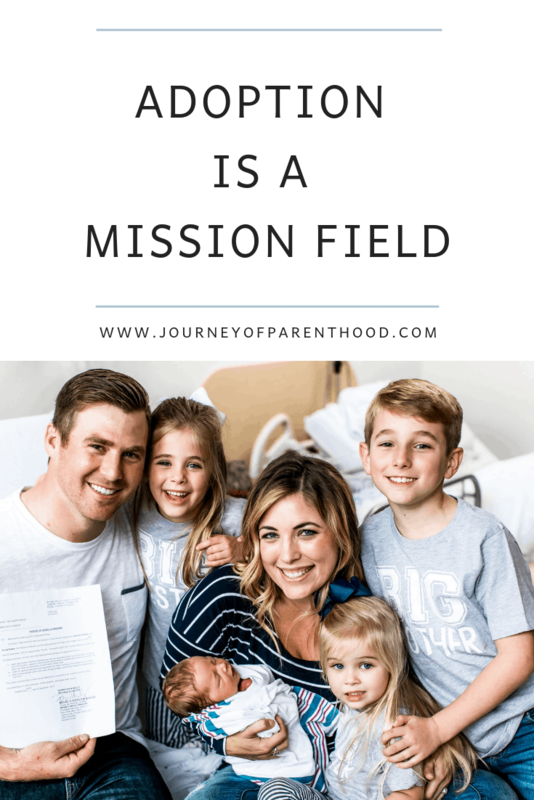 I KNOW it has had to help many a person choosing that mission field. I enjoy your transparency and reading all your blogs. KEEP up the good work and spread the gospel near and far. I would challenge you to consider (with empathy) the couples that cannot have biological children. For every domestic infant placed for adoption there are 39 waiting couples. You are in fact ” taking” that placement opportunity from an infertile couple regardless of how pure your motives. When parents with biological children claim they are being called to adopt I wonder why they do not become Foster parents? That is a real way to help children that may otherwise have difficult childhood’s. I just question whether you’ve listened to God’s call appropriately. I tried to post using my phone first but I don’t think it worked! Anyway….I would challenge you to consider (with empathy) adoption from the perspective of couples that cannot have biological children. For every domestic infant placed for adoption there are 39 waiting couples. You are in fact “taking” an opportunity of placement from an infertile couple regardless of how pure your motives. If you believed you were being called to adopt I don’t understand why you wouldn’t become foster parents? Fostering in a real way of helping children from hard places have either a temporary stable home or a permanent one and an obvious opportunity to share the gospel. I don’t question that you felt called in some way but I do question whether you followed through in the right way. Hey Andrea! Thank you for your thoughts. Our adoption is finalized and we’ve been able to see God’s story really come full circle in our lives and the way every little star aligned has truly shown us how God had His hand all over this situation and made our path clearly from His Will. Our son’s birth mom told the lawyer if we hadn’t been in the mix of books she saw then she wouldn’t have chosen anyone. I pray that all those who struggle with infertility and feel lead to adopt are matched with the baby they are meant to parent. Just because we had biological children doesn’t make our adoption any less meant to be or our calling any less from The Lord. Foster care is a true calling as well but it’s not the same as adoption and is not something we have yet felt called to do. Thank you for your response. I believe you are still failing to see my point. Some of the “negative” comments you got while in the adoption process are just in fact true statements. You don’t know God’s will you can only try to understand it based on Biblical knowledge. The things I’m saying may seem offensive but they are just a counter argument from another Christian perspective. Your comments don’t seem offensive at all! Just dumb. It’s amazimg when someone as small minded as you tries to bring darkness to something so bright and positive. Really sad. I for one don’t let people like you who spin stuff negative effect me or my life. I am sure Emily won’t either as she has shown in her blog that she is strong. And Fod warns that satan will use people like you to tear other down. God bless you and your hardened heart.